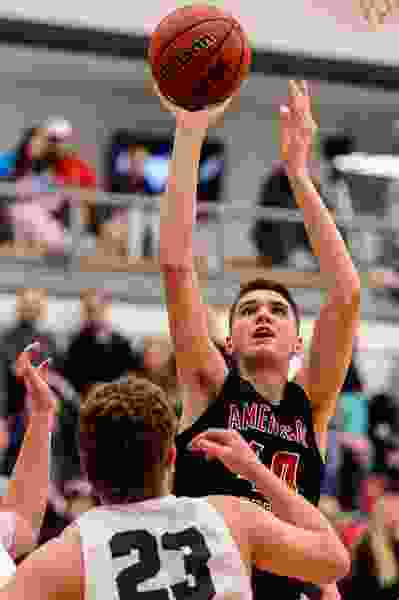 (Trent Nelson | The Salt Lake Tribune) American Fork's Isaac Johnson as American Fork hosts Olympus in the Utah Elite Eight tournament, Saturday December 9, 2017. And Isaac Johnson, the 6-foot-11 junior, hopes he made the same impression on everyone else at the National Basketball Players Association Top 100 camp last week in Charlottesville, Va.
Johnson has been busy this summer, playing on the AAU circuit with his Exum Elite squad and attending some of the nation’s top camps. He has been busy, too, climbing up the national recruiting rankings. According to 247Sports.com’s composite rankings, Johnson is the top recruit in the state and the 49th-ranked recruit in the country. The sharpshooting big man holds offers from 10 universities including USC, Gonzaga, Ohio State, Stanford, Utah and BYU — and he gets more letters, text messages and phone calls every day. The young forward’s mix of size and skills are an intriguing combination. Johnson’s father played collegiately at Utah State University and his older brother, Spencer, is a guard at Weber State. Growing up at their home in Utah County, Johnson practiced to be a guard. “We didn’t know how tall I was going to be,” he said. He shot up to nearly 7 feet — and he may not be done. Over the past few years, Johnson has added an inside game while keeping his ability to shoot or put the ball on the floor. Last season, he averaged more than 18 points per game for American Fork, and his performances have earned him invites to some of the country’s top camps this summer. Last week, he was one of 100 players invited to Charlottesville, Va., along with two of his Exum Elite teammates, Olympus’ Rylan Jones and Pleasant Grove’s Matt Van Komen. Johnson plans to start his recruiting trips once the AAU season ends around the last week of July, and then make his final decision on where he will attend college before the start of the upcoming high school basketball season. He has started to envision a state title for American Fork, a successful college career and, finally, a spot in the NBA. “That’s the dream,” Johnson said. Johnson has played against other prospects — players who will likely be in the NBA Draft this time next year — and held his own. Johnson believes, when all is said and done, he’ll prove to everyone he deserve to be there too.